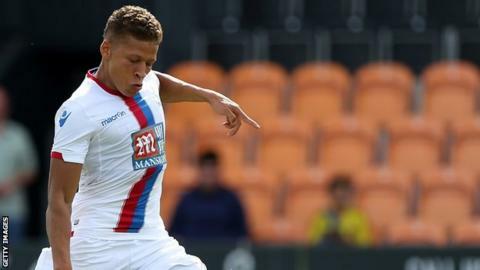 Crystal Palace forward Dwight Gayle has until the end of the week to decide whether he wants to join Bristol City, says Robins manager Steve Cotterill. City have had an undisclosed bid accepted for the 24-year-old striker. Cotterill said talks have been held with his advisors but he has yet to meet Gayle, who is also wanted by several other clubs. "We won't stay on it forever. It's getting to a crunch time this week with that one," he told BBC Bristol. "There is nothing more I can tell you. We are not any further down the line with anything. There's been a couple of conversations that have been had, not face to face. We have a timescale with it. "He wants to think about it. That can only go for so long." City have been largely frustrated in their attempts to recruit players, with Cotterill working hard to bolster his Championship squad before the end of the transfer window on 1 September.